Most people - myself included - would tell you that I am NOT on the cutting edge of fashion. I will be the first one to roll out of bed, pull on a t-shirt and whatever pants are clean and head out the door to work cows. Unfortunately, my Monday thru Friday dress code at the office can't consist of t-shirts and jeans so each spring I like to pick a few items that will freshen up my wardrobe, and help me head into summer feeling good. Summer here in Eastern Oregon can be a hot, sweaty mess and the least I can do is look presentable at work. And if the items transition to looking nice in public when I'm off of work - well, that's a win/win! So for this Friday I thought I'd share 5 of my favorite spring wardrobe items. 1. Why hello Sam Edelman! Long story short, I broke my favorite pair of black wedges last fall walking across a gravel lot at our new office space while it was under construction and I hadn't found a replacement for them. So last weekend while I was in town picking up feed and a new grease gun (glamorous, I know!) I stopped by Andee's Boutique and Brandi helped me pick out two new pairs of sandals. Hey a girl's got to STICK TO HER BASICS. At least it was a Tee by Tina. 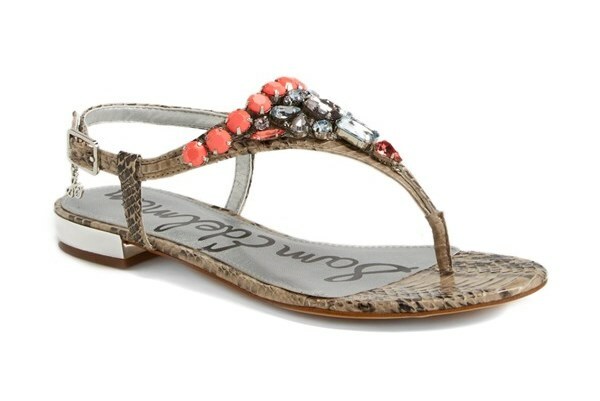 I ended up purchasing two pairs of Sam Edelman sandals - the Dayton embellished sandal in a gray/coral and the Eavan gladitator sandal in black/gold. I'm head over heels in love, and while it might have been a bit of investment at first - I think I'm going to wear every penny out of these suckers this year. Shop local and freshen up your spring wardrobe - a win/win for everyone! I have found the motherload that is the perfect work pant. Doesn't need ironing - check. Washes & dries beautifully - check. Looks classy for work - check. Is comfortable as ALL GET OUT - checkity check check CHECK! Let's dis-regard my terrible selfie taking skills, shall we? Muchas gracias. I already own the black & amalgam (above) and I just bought another pair. I know - I don't even know who I am anymore. But I figure for $22 (I got them when the site was 30% off), I can afford to have the white pants I've been dreaming of. And if I get cow crap on them and can't bleach it out - well, then I'm only out a $20 bill. I ordered the white pants in a petite size - I'm going to see if the shorter length will keep the hems cleaner. But I order the normal length in the other colors. 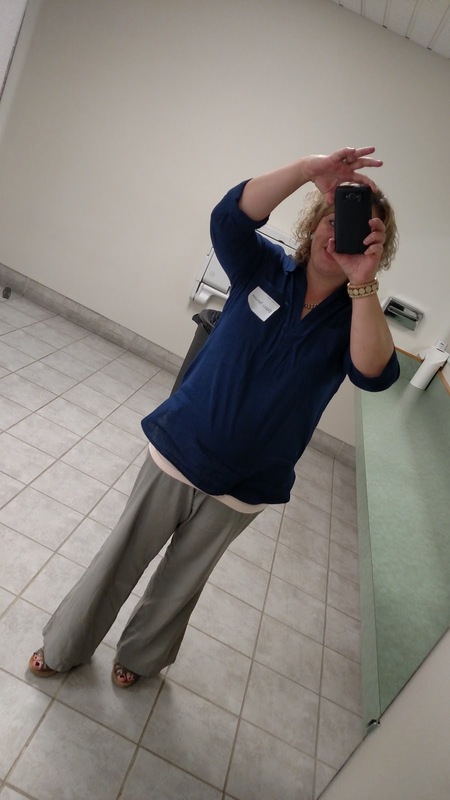 I've worn these pants both with wedges and with my new flats from Andee's - because of the waistband, you can adjust them to wherever is comfortable on your waist and to a length that works with your shoes. Since I loved the pants so much, I also bought two tunics made from the same material. The ones I ordered were too big - which is a nice problem to have - so I shipped them back and got my correct size delivered this week. I ordered the Lost at Sea Navy (I'm wearing it in the selfie picture above), Blackjack and Red October Neon (pictured here, which is more like a coral). Because when I find something I like, I order it in multiple colors. 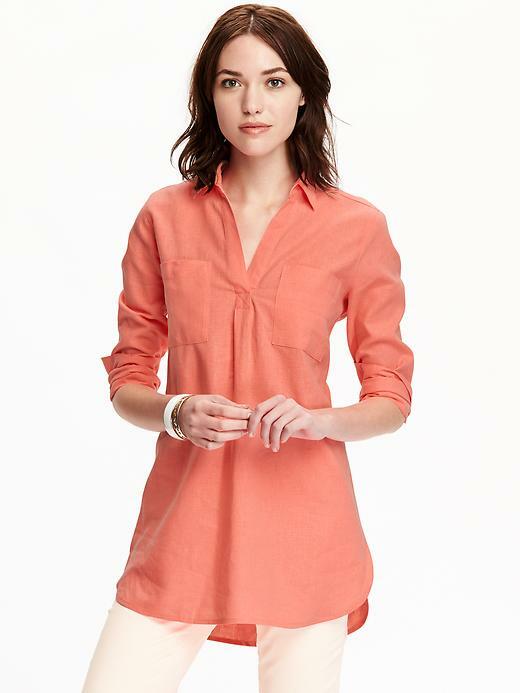 The material is cool & breezy, but I think it looks nice enough for work and they'll be easy to pair with jeans. They're super affordable, and the yellow stripe version is only $15 right now! 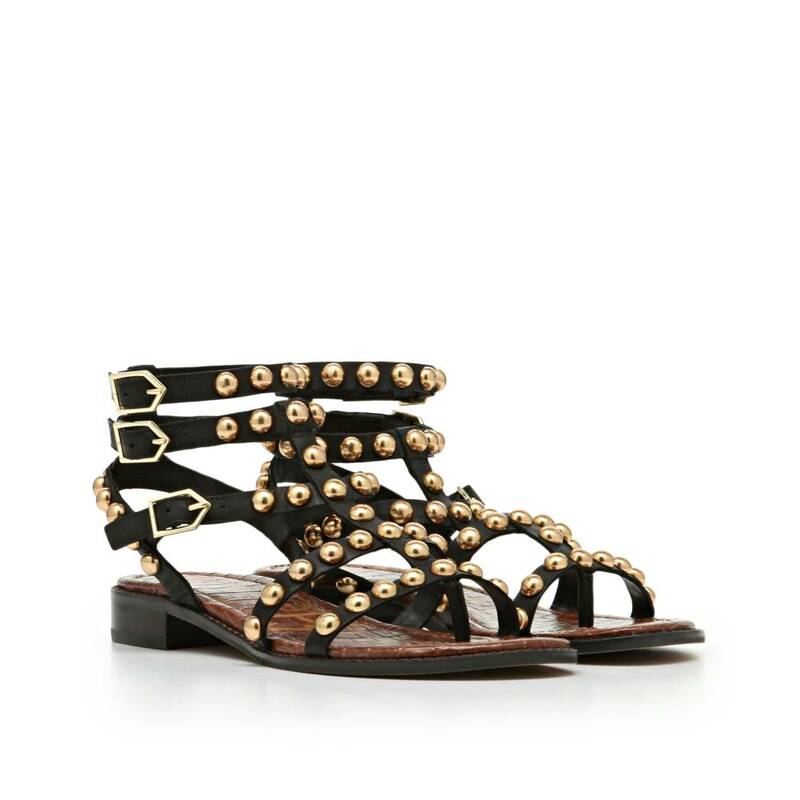 I'll be wearing the heck out of these puppies this spring and summer. A note about sizing - I ordered the coral & black tunic in the tall size found online - the extra length worked well for me and is perfect for wearing with leggings. But the navy tunic I'm wearing in the picture above is a regular (they didn't have my size in tall) and I thought it was a good length too! 4. A fun pair of earrings. I get the most compliments on these earrings and they were a WHOPPING $8 American dollars. That's like two coffees from Starbucks. 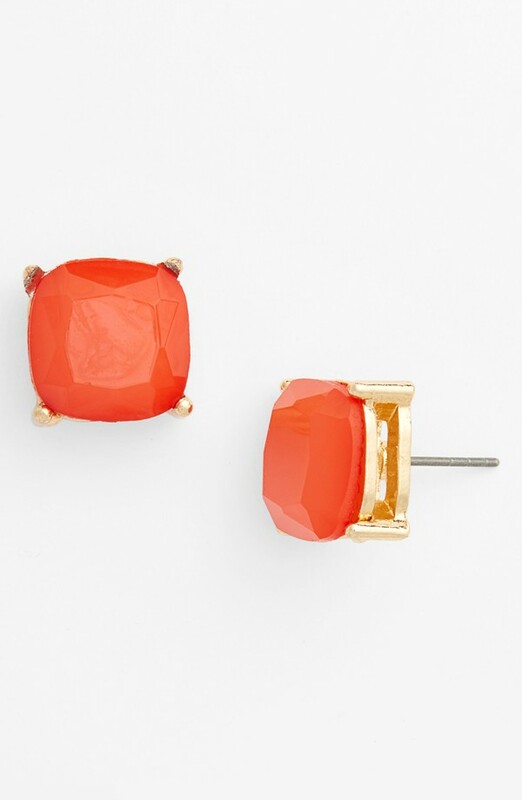 It's amazing what a cute pair of fun earrings can do for an outfit. 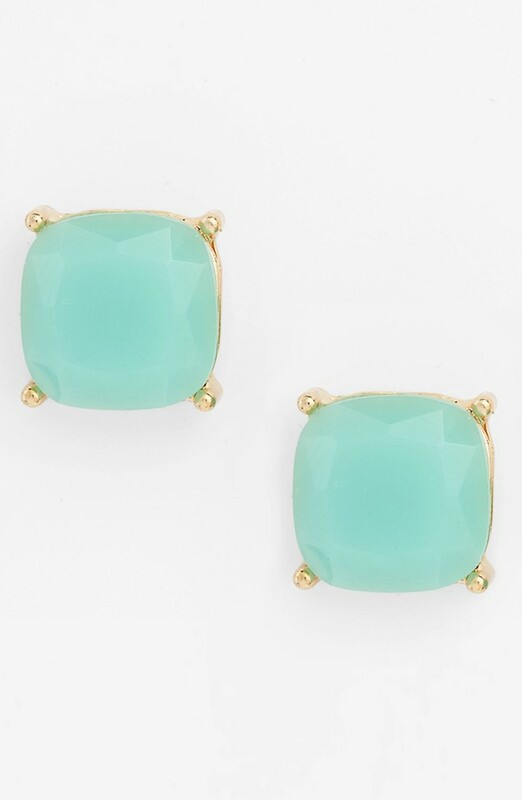 I also bought these earrings for each of my staff for Easter, and it's so fun to see them wear them as well - they're the perfect little pop of color! I have been looking for a new pair of sunglasses since the pair I bought last year for $5 at WalMart were scratched all to heck and looked pretty rough. 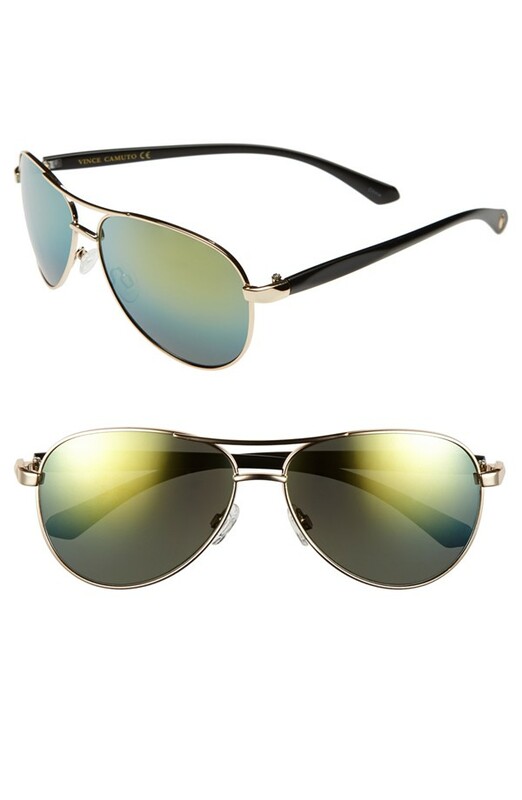 I have a pair of polarized sunglasses I got at Costco this fall that I wear when I'm helping on the ranch, but they're not the most feminine so I've been keeping my eye out for a pair of "nice" sunglasses. But then Morgan arrived this week to help breed cows, and he brought a pair of sunglasses Kim had sent with him for me to have and I LOVE them! 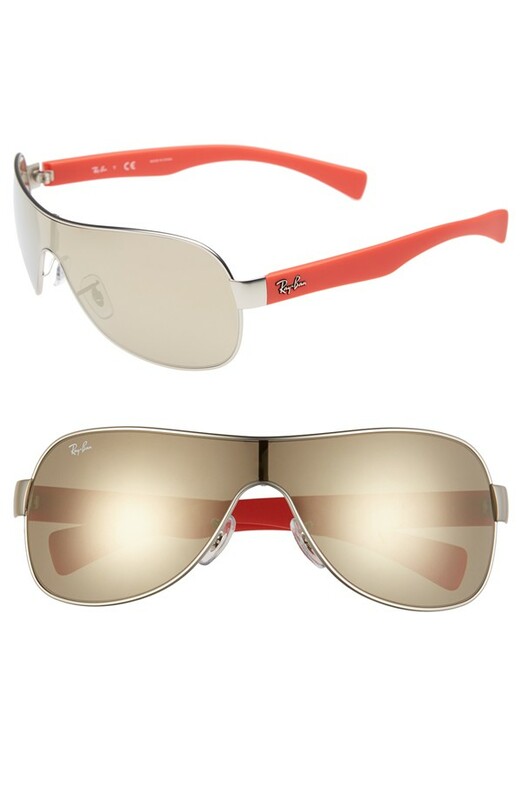 So my hunt for sunglasses is over, at least for now! Happy Friday to you - keep living the dream! Do you do stitch fix? I think you would love it! You will have to check it out. I absolutely have a ball with it and if you need any more info on how it works shoot me a message (audrey.cant@imblersd.org) I will be glad to fill you in! Love reading all your fun stuff on here!